Hey everyone! 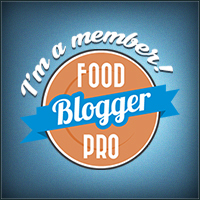 I am so excited to have Candi Elm from A Day In Candiland share a yummy treat with us today! Do you love to munch on snack mix? 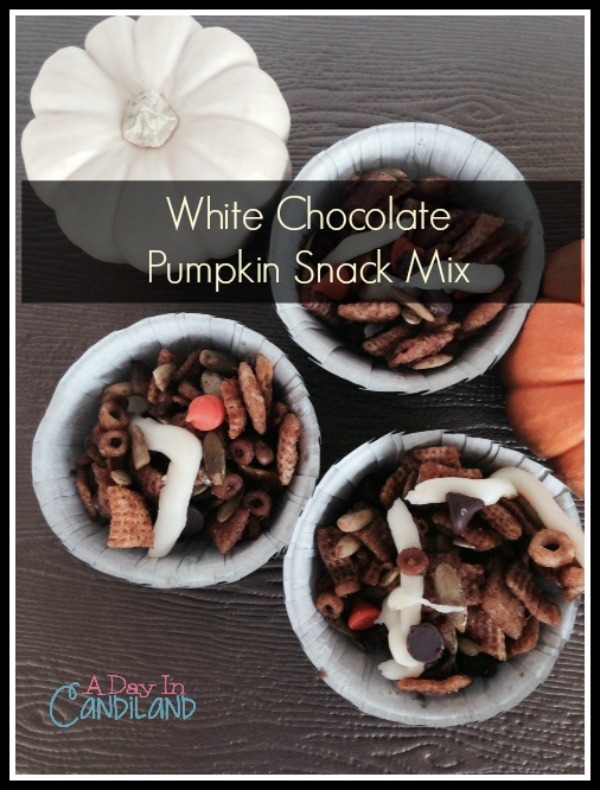 I recently made this White Chocolate Pumpkin Snack mix and I love the two tastes of sweet and salty in it. I also am thrilled that Chex mix has so many options out there and recipes are on their boxes, but I always like to change it up a bit. This mixture is a little more moist than their dry ones, but it is just as good and full of pumpkin flavor. If you like pumpkin as much as I do you can try some of these pumpkin recipes I wrote about. The great thing about these snack mixes is they are fast and you could literally add anything you want to it to give it a different twist. It took me about 20 minutes total to put it together. I got some cute paper cups from Wilton to use as individual favors. You could also put them in holiday baggies like the Halloween, Fall or Christmas ones, and give them out as treats or take for school snacks. I like to put them in a big gallon size bag to keep fresh, but that is only if it lasts that long. You could make a double recipe to get you through a few days. Maybe even add a few pretzels or peanuts to the 2nd batch for a little change. 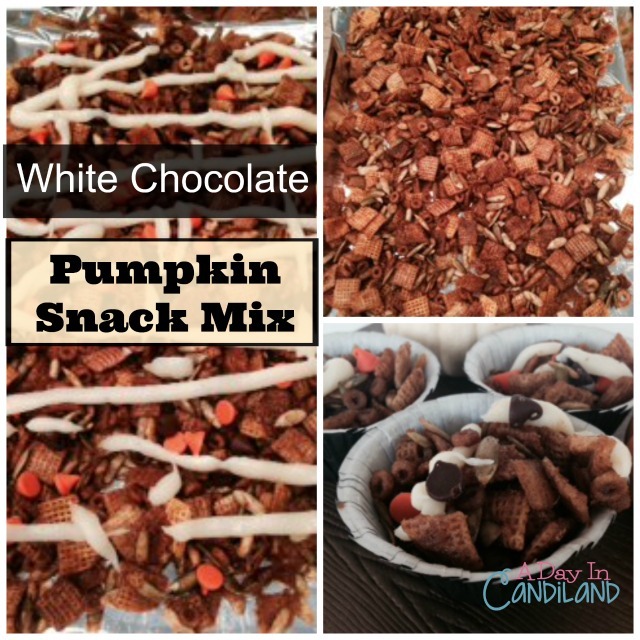 If you like this White Chocolate Pumpkin Snack Mix, try Summers M & M White Chocolate Snack Mix or Snickers Snack Mix. I want to thank Summer for letting me visit with her readers. You can find me over at A Day in Candiland where I blog about desserts and family recipes usually over a cup of tea. This looks delicious, I can’t wait to try this with the kids… My kids are little snackers and they love pumpkin, perfect! 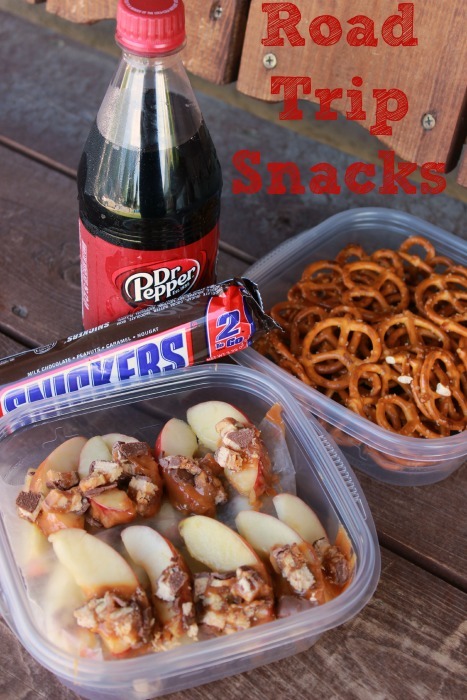 This is perfect for snackers. I am sure they will love it. Ooooh, this sounds SO good! I’m thinking I will have to make some this weekend – we’re celebrating Thanksgiving here in Canada and this will be perfect! Thanks Sylvie, Yum, enjoy your Thanksgiving.